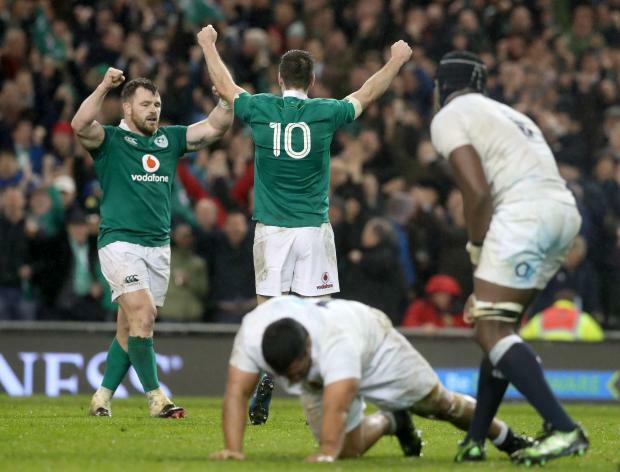 Ireland stunned England 13-9 in the Six Nations to deny their old rivals a second successive grand slam and end their hopes of a world record 19th successive victory. Joe Schmidt's Irish team secured a top seeding for the 2019 World Cup draw as a try by lock Iain Henderson after 23 minutes proved the difference between the sides. While England improved after being completely dominated in the first half, they failed to make a serious dent in the Irish defence. England sealed victory in the tournament last week with a 61-21 thrashing of Scotland, but the Six Nations trophy will be awarded to a downcast English team, the third in 16 years to be denied a grand slam in Dublin on the final day of the tournament. The loss ended England's 18-game winning streak, leaving them tied with New Zealand for the record. Victory rescued a poor Six Nations championship for Ireland, who lost to Scotland and Wales after beating three top teams in the southern hemisphere last year. Ireland ended the tournament in second place and are guaranteed to be one of the top four seeds in the draw for the 2019 Rugby World Cup.